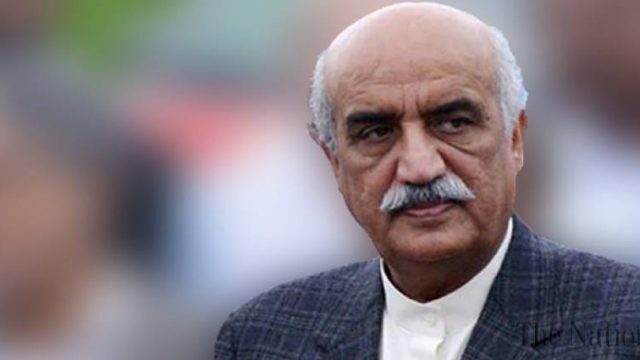 SUKKUR: Pakistan People’s Party (PPP) leader Khursheed Shah on Saturday criticised statement made by Prime Minister Imran Khan regarding ‘U-turns’ and said that there could be no greater change than a democrat appearing in Adolf Hitler’s form. “All Pakistanis who uphold democracy would have been shocked at the prime minister’s statement,” Shah said while addressing a ceremony in Sukkur. “Even Zia-ul-Haq and Yahya Khan did not liken themselves to Hitler. [Pervez] Musharraf did not even do that,” he said. “The kind of language that is used in the Parliament today is shameful. We have never before heard such language in the Parliament,” he said. “The opposition will not interfere in the government’s affairs if it does its work. The current Parliament has not been able to pass any laws,” he added. “We constituted National Finance Commission (NFC) after approval from all four provinces and today, attempts are being made to it. The 18th Amendment safeguards the rights of provinces and it is the need of the hour that the country has a strong federation,” remarked the PPP leader.